Highly regarded Chaparral Boats of Nashville, Georgia builds a complete line of family pleasure boats in seven series of sportboat runabouts, cuddy cabins, deck boats, tow boats, cruisers, plus the 420 Premiere Sport Yacht. The Signature Cruisers series consists of six models of mid-cabin express cruisers from twenty-seven to thirty-seven feet. The most recently introduced 330 Signature is Chaparral’s “first cruiser to offer two completely different cabin interior options.” To be able to even have a choice of interior layouts in this size of cruiser is highly unusual and a real bonus to prospective owners. The difference in the two cabin layouts involves the portside seating and forward berth areas. The standard layout provides a long multi-seat L-shaped lounge which extends across and in front of the V-berth area. The backrest of the forward portion of this lounge flips up to extend the V-berth into a double berth. A standard side-mount table with its own dedicated storage compartment combines with the L-shaped lounge as a large dinette. An optional air mattress converts the salon couch for additional sleeping accommodations. The optional interior layout offers considerably additional floor space with a lounge to port and the dinette forward in the V-berth area. The dinette table electrically lowers to convert that area to a berth and a standard air mattress filler is added to form the berth. Lined drapes provide privacy for this forward area. 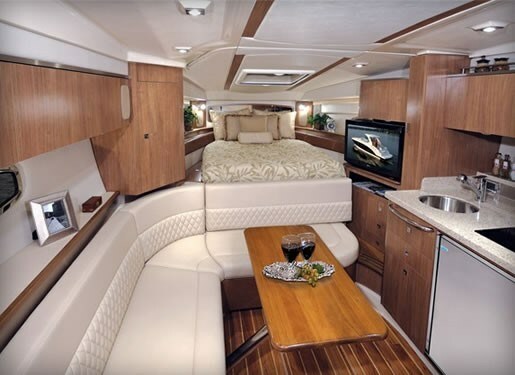 With both layouts, a 22” flatscreen TV/DVD is mounted between the galley and the V-berth, on a pivot, so it can be rotated to be watched from anywhere inside the boat. This TV comes standard with a hardtop-mounted antenna and is also wired to a dockside coaxial cable input. Three choices of interior fabrics, decor and colour accents are available as are fitted sheets and classy teak and holly flooring instead of the standard carpet. Air conditioning/ heating as well as a generator are also available. The U-shaped seating of the mid-cabin is identical in both interior layouts and the hull depth of the 330 allows for ample headroom in this area. Cleverly, Chaparral has arranged for the seat cushions to fold out on sliding tracks to convert this area into a large sleeping area without the need for additional filler cushions. A sliding entry pocket door instead of the usual curtains provides greater privacy for the mid-cabin. A side-mount table is optionally available for this area too as is a 19” flatscreen TV/DVD. The starboard side galley is compact and well equipped with stainless steel appliances including the refrigerator, microwave, and sink plus a flush-mount single burner electric stove. The molded fibreglass head compartment provides a VacuFlush™ toilet with holding tank level monitor as standard equipment plus a handy fold-down seat over the toilet for use as a change table or when showering. The cockpit of the 330 Signature is unique, roomy, and provides lots of seating with a U-shaped lounge to starboard behind the helm seating and across the transom. The transom portion of this PowerSlide® lounge electrically slides down and forward to form a huge sunlounge together with the rear-facing transom seat. A removable cockpit table is standard as is a carry-on cooler with dedicated storage. There is a single adjustable captain’s chair plus a double companion helm seat beside it. Snap-in carpet is standard as is a hot & cold transom shower and a wet bar. Optionally choose a refrigerator and/or a cockpit gas grill. A full camper canvas enclosure is standard equipment. A stylish fibreglass hardtop is standard on the 330. It has a forward centre-opening hatch to allow easy foredeck access through the opening windshield section. Twin MerCruiser or Volvo Penta sterndrive power is offered with the 330 ranging from 260 to 300 horsepower and with or without MerCruiser’s Axius or Volvo Penta’s Joystick control systems. Twin Volvo Penta diesel sterndrives are also available. A large, flat centre-dash section is available for your choice of electronics or choose the factory optional Garmin 5212 GPS plotter with or without radar. 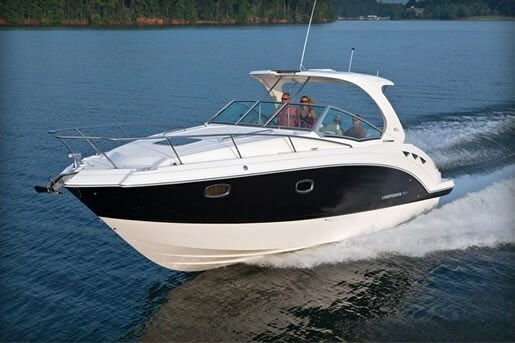 The Chaparral 330 Signature is a complete boat, unique in so many ways, and so well equipped from the get-go. To have the choice of two interior layouts is simply an added bonus.